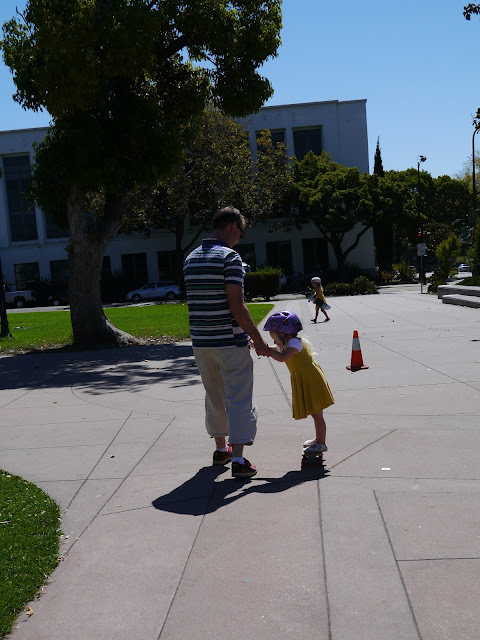 Yesterday we were a family of skaters! Ok, not quite... 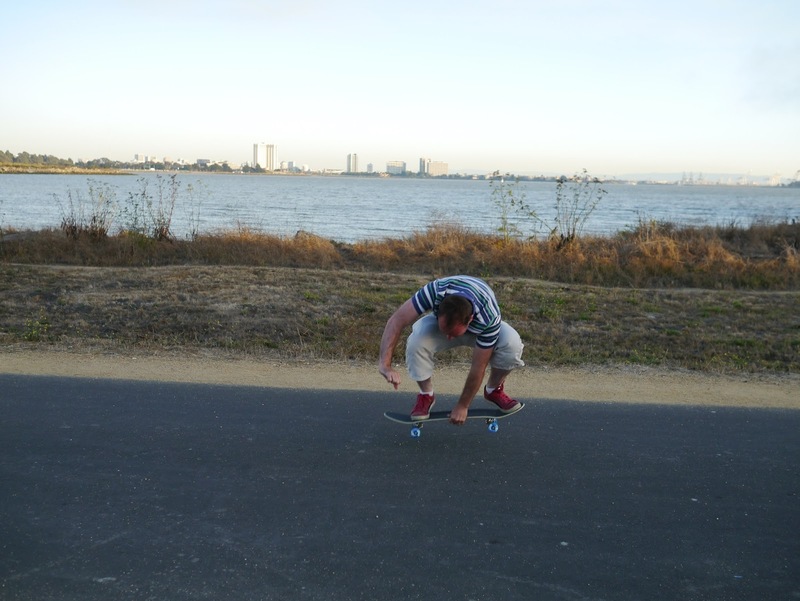 I let the team down with my lack of wheels, but three out of four of us were skaters so close enough. 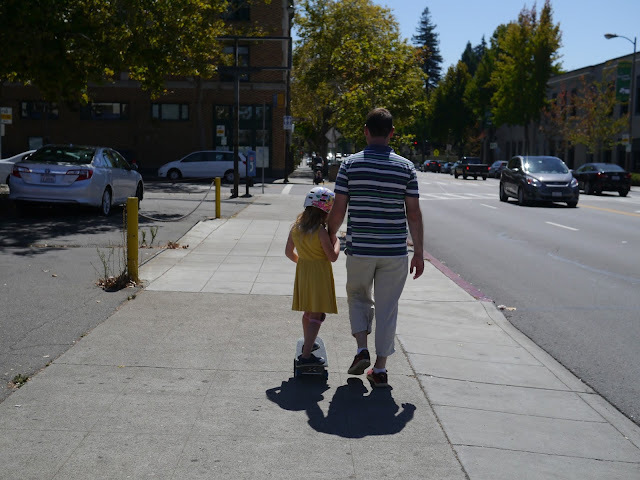 Yesterday morning Kim bought himself a skateboard to ride to and from the train when going to work. That probably sounds a little odd to my friends back home but here in Berkeley and San Francisco skateboarding is a relatively common way to get around. 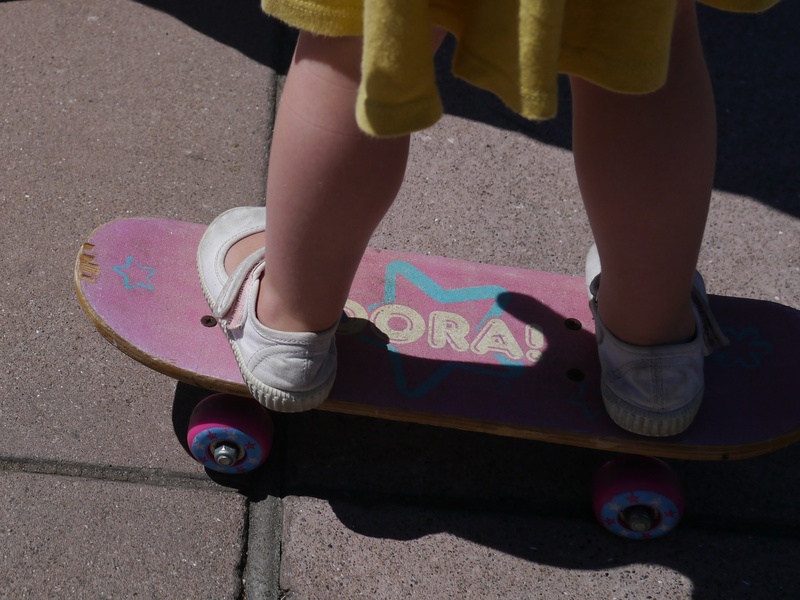 So the Dora skateboard was handed down to Lola and we headed back to the skate store to get Ava her very own real skateboard. 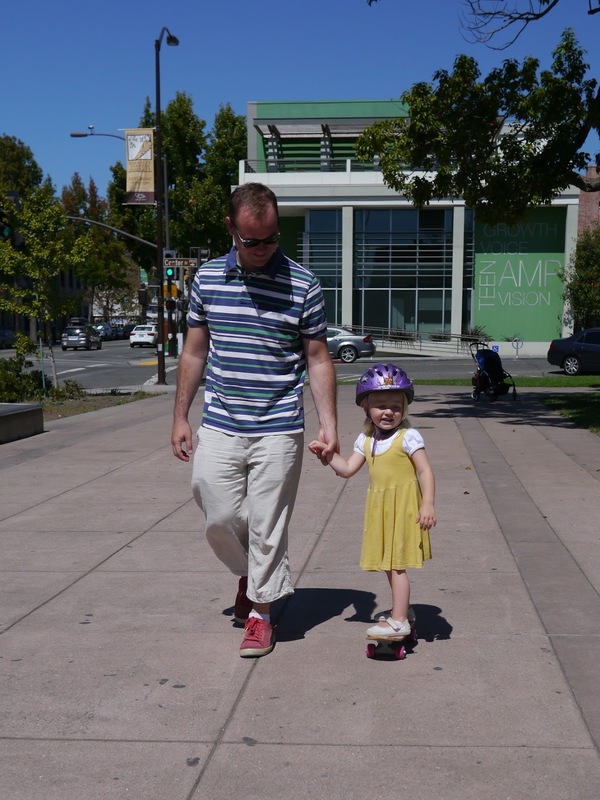 On the way to the store the girls wanted to skate. So with helmets and knee pads on they skated their way down the sidewalk and through a park; Lola on the Dora skateboard and Ava on Kim's. 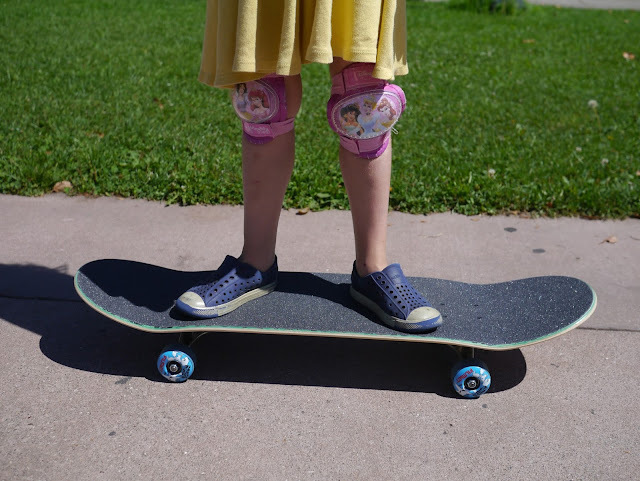 Judging by all those bruises and scrapes she needs more than just knee pads! At the skate shop there were plenty of decks to choose from, most of which unfortunately were a little big for Ava. 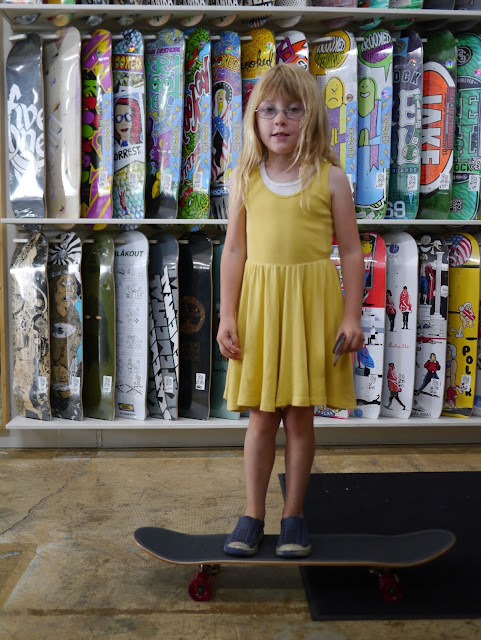 I guess skate shops don't really cater towards six year old girls! We ended up going with a fairly plain deck and Ava was excited to learn that she could decorate it with stickers. 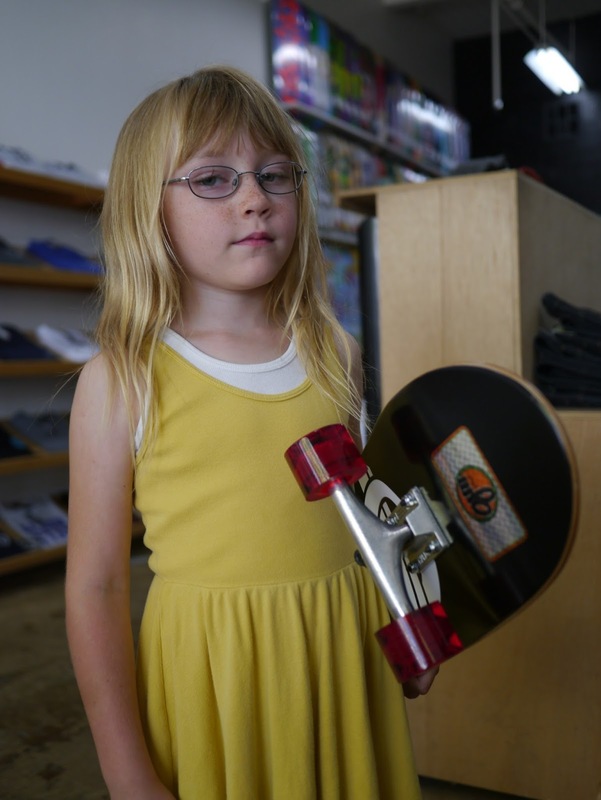 Ava then choose a set of red wheels and the guys in the store set about building her skateboard. Ava had expected the boards to come ready built so she was interested to watch the guys build her skateboard. Grip tape on top, trucks underneath, the wheels on and a little adjusting. Perfect! It just needs one more thing... stickers! 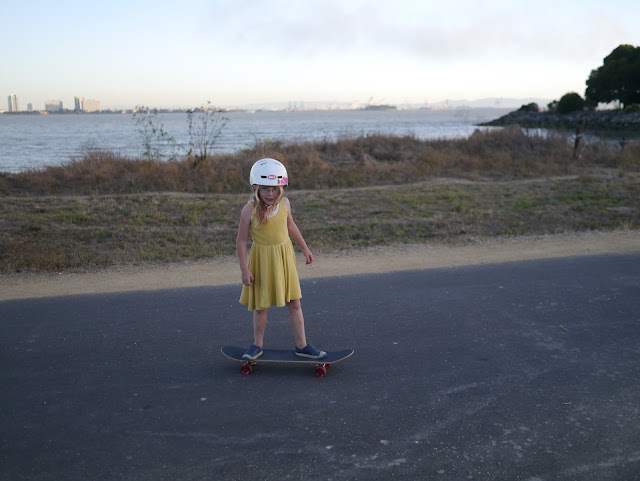 With Ava's new skateboard in hand there was just one thing to do. Get out there and practise skating! 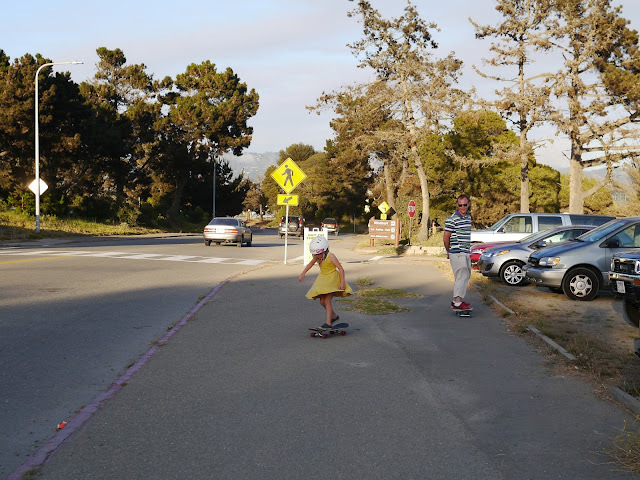 We headed down to Berkeley Marina to meet some friends and Ava made use of the flat, wide sidewalks, zooming backwards and forwards on her skateboard. Kim decided to show off! So far Ava is pretty good at going straight but she hasn't learnt how to turn properly yet. 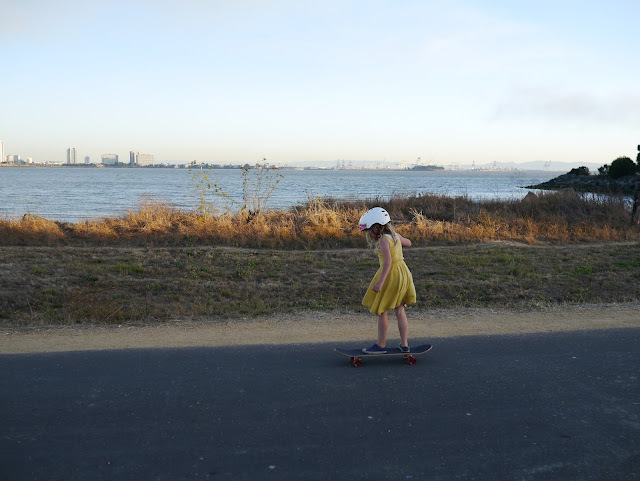 She tends to jump off, adjust the board to the direction she wants to go and jump back on again! 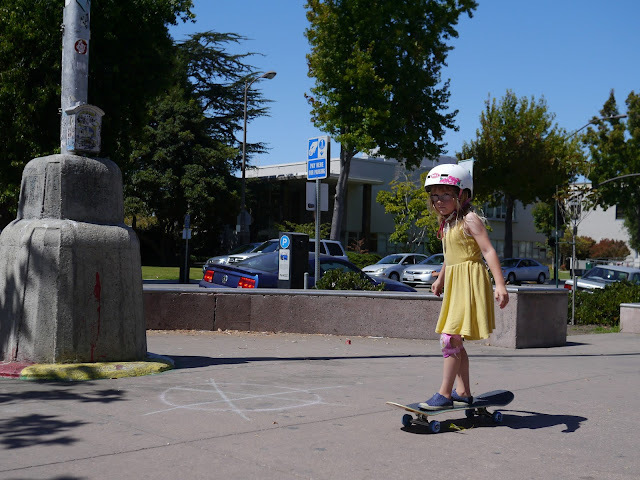 She's pretty confident and her balance is good as she's used to ice skating and riding her scooter. 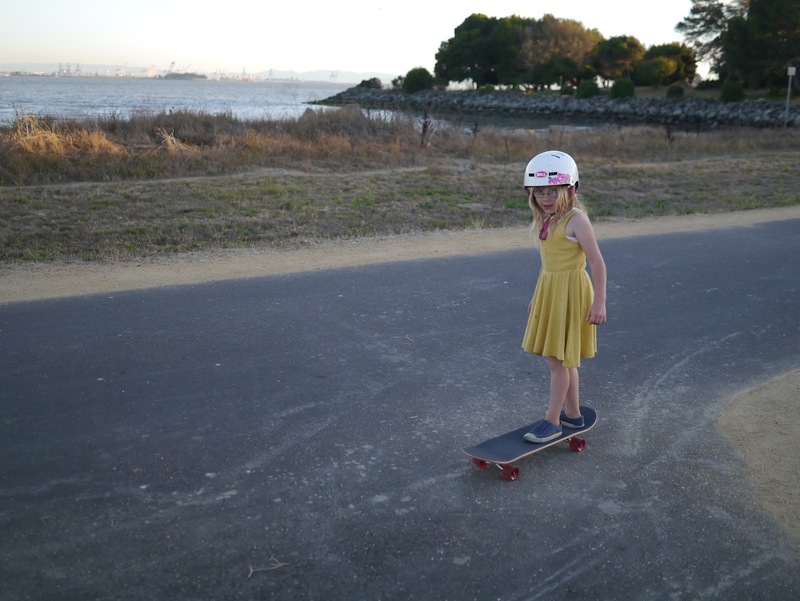 She just needs to learn to stand on the skateboard properly as she stands on it like a scooter. With Daddy's help she'll get there. 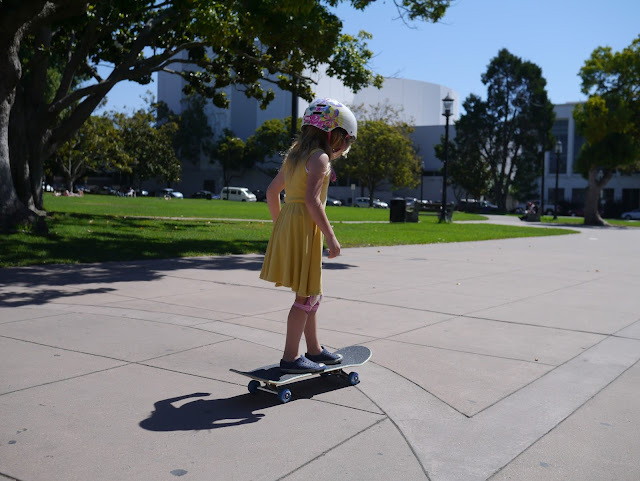 She'll be doing tricks before we know it! And of course, whatever Ava learns to do Lola is keen to copy. We'll have two little skaters in our house. 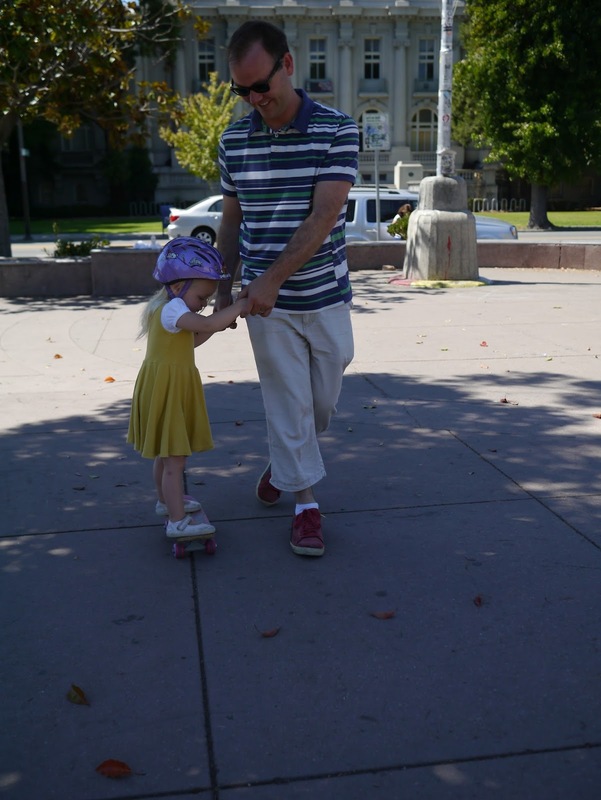 Plus one big skater too. Oh, and in a complete coincidence, the dress that the girls are wearing in these shots is American Apparel's Skater Dress. Looks like it was meant to be! 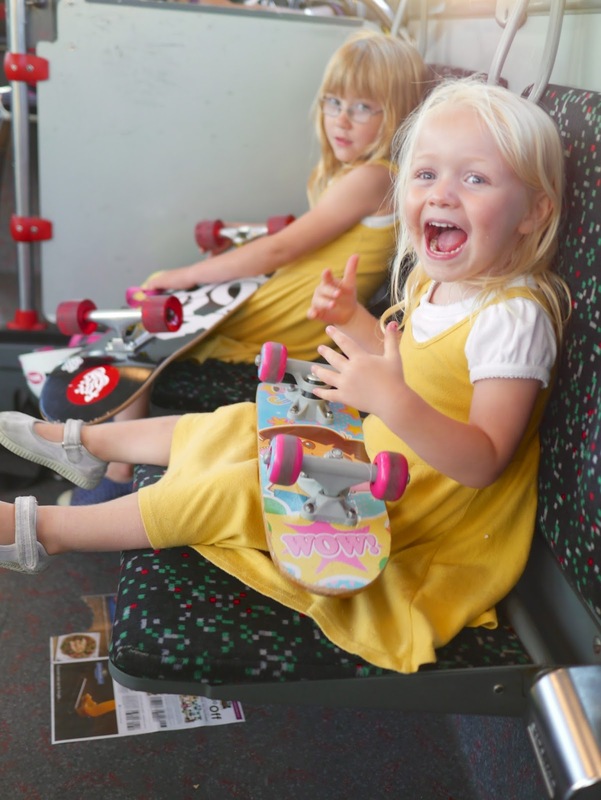 After read the article i have known about skate girls discussion which is very amazing and exciting because these picture has impressed me too to learn skateboarding to my daughter.